Roast duck is an indulgent yet surprisingly easy meat to cook. The plum sauce that accompanies it in this recipe can be made ahead of time (even the day before). At Season’s Eatings all the recipes are fully tested, and we can definitely confirm that the more you can muster up with what apparent ease will earn you brownie points with any guest or date. This dish is served with asparagus and hollandaise sauce, the recipe for which can be found in an earlier recipe here. Start by making the plum sauce. Add a big knob of butter to a saucepan with a drizzle of olive oil (this will stop the butter burning) and place over a medium heat. Once the butter is foaming, add the onion and fry for a couple of minutes until translucent. The onion should become soften rather than turn golden brown. 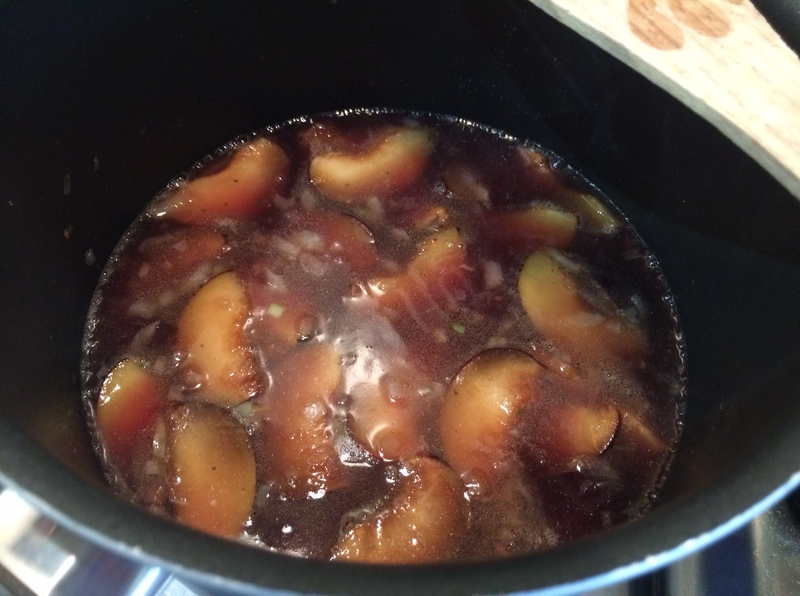 Then add the plums and sugar and stir until the sugar has dissolved. Next, pour in the red wine and beef stock and bring to a boil. Leave to simmer for 15 minutes, before taking off the heat and transferring to a jug. This sauce can be put in the fridge overnight and re-heated the next day. Next make the mashed potatoes, which can be done about an hour ahead of eating and then reheated, or if you’re confident with your timings, you can make this ready for dinner. Peel the potatoes and slice in 1cm pieces. Add to a pan of salted, boiling water and allow to cook for approximately 10 minutes until soft. Drain then add back to the pan. Add another big knob of butter, a good pinch of salt and pepper and begin to mash. You can loosen the mash slightly by adding milk. You won’t need more than a couple of tablespoons, so be careful to add it a little at a time else the smooth mash will turn into slop. The duck can be prepared in advance. This is done by simply scoring the skin (at about 1 cm intervals) and rubbing in a bit of salt and pepper. The only things left to do are to boil the asparagus and cook the duck once your date arrives. After a glass of red (or bubbles), pre-heat the oven to 180ºC. Add a tablespoon of olive oil to an oven-proof skillet or frying pan, drop in the duck breasts skin-side down and cook for 6 – 7 minutes. Flip over and fry for 3 – 4 minutes on the other side, basting with any juices in the pan. Transfer the pan to the oven and cook for a further 4 – 5 minutes. 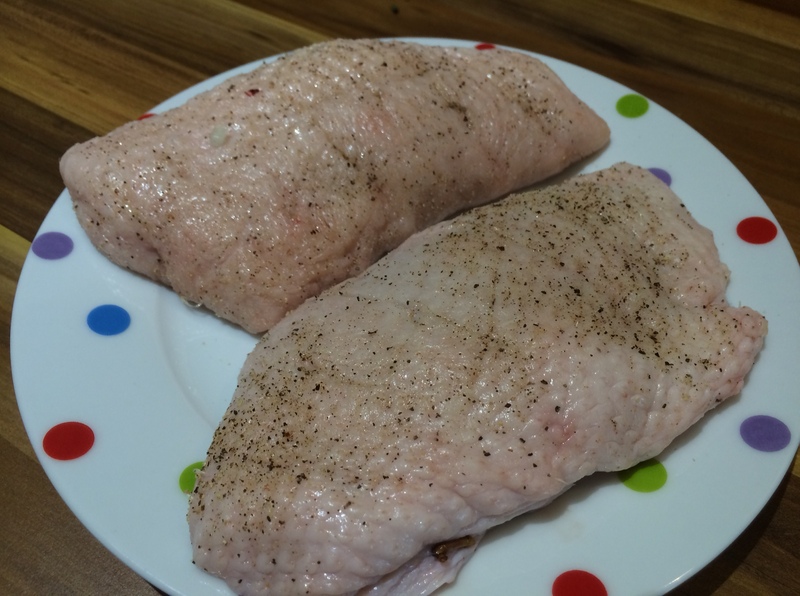 If you don’t have an oven-proof frying pan, transfer the duck breasts to a regular baking tray. The duck should be crispy on the outside and just blushing in the middle. In the meantime, toss the asparagus spears into boiling water, which should only take 3 – 4 minutes to cook. 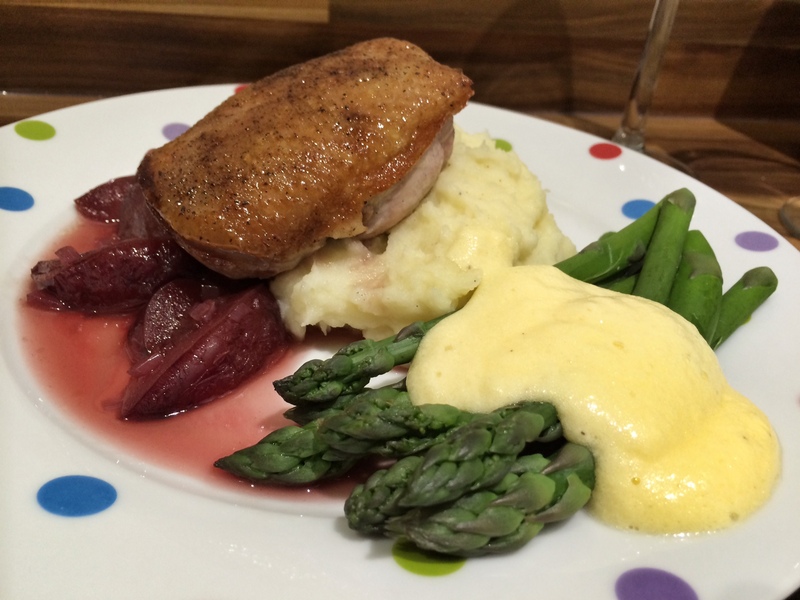 During this time, also re-heat your (homemade or shop bought) hollandaise sauce and the plum sauce made earlier in the microwave. To assemble, add a spoonful of mash to the middle of the plate. At one side of this add 5 – 6 wedges of plum pieces from the sauce, as well as drizzle of the maroon liquid itself. Place the duck (skin-side up) atop both of these. Finally lay the asparagus neatly on the other side of the mash potato and drizzle with hollandaise sauce.